Picketing at 15 UNO/Acero sites enters fourth day, as clouted CEO remains MIA at bargaining. 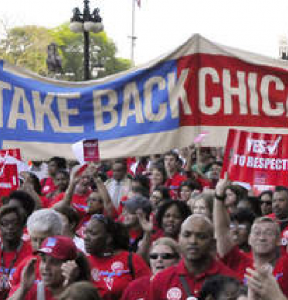 CHICAGO—With the CTU’s historic charter strike entering its fourth day, educators are planning to reinforce the picket line at Paz at 2651 W 23rd St., where a Monterrey Security contractor assaulted a teacher the morning before, prompting a parent to call police. School management has brought in extra contract security staff from the clouted security company, owned by the brother of UNO cofounder and retiring Chicago Alderman Danny Solis (25). Many of the students at Paz hail from Little Village and Pilsen, where Solis’ ward office is located. Teachers and paraprofessionals will be on the Paz picket line and available for press interviews starting at 6:30 AM. Friday. Strikers from UNO/Acero’s south side schools will rally at noon at the ward offices of 14th ward alderman Ed Burke, who’s increasingly Latinx ward houses seven Acero charter schools. They plan to send a delegation into Burke’s office at 2650 W. 51st Street to demand that Burke personally reach out to Acero CEO Richard Rodriguez and his board to settle the strike, while educators picket outside. Burke, who’s offices were recently raided by federal agents, had longstanding ties to the HDO—the Hispanic Democratic Organization—as did Solis and Acero CEO Richard Rodriguez. While the HDO collapsed in the wake of a series of political scandals that sent its leader to prison, some of its heavyweight players—including Acero’s Rodriguez—remain active in local politics. Rodriguez has yet to attend a single bargaining meeting, while his team insists nothing can be formally agreed to at the table without his approval. 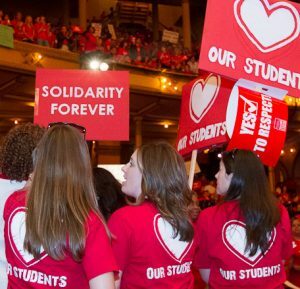 Teachers and paraprofessionals have made some progress on non-economic issues, and are at loggerheads on critical economic issues, including wages for paraprofessionals, some of whom earn barely a tenth of his $260,00 annual salary to run the network’s 15 schools. On Thursday, hundreds of strikers rallied and picketed downtown at the offices of INCS, the powerful charter operator lobby whose staff have been trolling strikers and supporting Acero management. Seven legislators attended, including State Representatives Chris Welch (7th District), Robert Martwick (19th District), and Will Guzzardi (39th District). The three are proposing a package of bills that would cap charter CEO pay, create minimum requirements for spending on core school operations—including instruction, instructional materials, building operations, transportation, and support services, require charters to have local school councils, establish a cap on charter school expansion in financially distressed school districts like CPS, and prohibit for-profit management companies from running charters. Legislators are also pushing legislation to restore an elected, representative school board to Chicago—​the only school district in the state whose residents are denied the right to elect their school board.